When I started posting reviews, I jumped on a soapbox - I lamented that we needed more reviews out there. I tend to get a lot of modules naturally (evidence: GM day stuff) but there's not nearly enough reviews to help differentiate the good from the bad from the great. I especially noted there didn't seem to be enough Swords & Wizardry reviews. Be the change, Beedo! 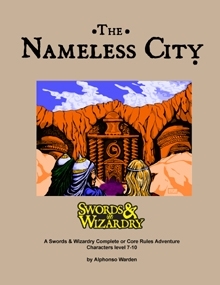 So here's a review of The Nameless City. The Nameless City is written by Alphonso Warden, published for S&W by Mythmere games. You can grab the pdf over at RPGNow for the low price of $4.95. I noticed the art is by the blogosphere's own Ostensible Cat, Jonathon Bingham; I loved the serpent man picture. It weighs in at 43 pages, and is for levels 7-10. The adventure site is an ancient city lost in the desert. It's loosely based on the HP Lovecraft story of the same name, "The Nameless City". In the Lovecraft story, the protagonist discovers a city built by a primordial race of crocodilian reptile men; the module replaces them with the more familiar serpent men (of Valusia). The module describes about 15 encounter areas in a cavernous, underground ruined city, and then 3 small dungeons within the ruins. What did I like about this product? First off, the atmosphere and vibe does an excellent job of capturing the spirit of pulp adventure, starting with a weird purple smoke monster that can lure the unwary into the city (and to their doom). If you like Lovecraft, Robert E Howard, or Clark Ashton Smith, this adventure will be right in your wheelhouse. Entering the city will be very memorable for the explorers in the group. There is no overarching plot or story. What we're presented with is an adventuring site, some history, game statistics, and wandering monsters; it's largely up to the DM to determine how the inhabitants of the city respond to attacks and bring it all to life. There are plenty of dangerous battles with magically endowed serpent people - the serpent people of Valusia had sorcerors, after all - and the author provides example tactics that should help the DM run otherwise complicated high level battles with lots of abilities. I thought the tactics were a really nice touch. I should also point out, the full game statistics are placed after the room description and are set off from the room text. I know it's a small thing, but I find it helps combats run better at the table when full stats are provided in this way. As for issues: the lack of a strong plot hook may turn off some DMs. Since I try to run a free form / sandbox style game, I see that as a feature, one less thing to cut. Someone else's opinion may be different. As presented, the city is very dangerous, with a very high bar just for entry. Without a compelling reason to go on, some groups may just turn around after their first bloody nose. The individual DM will need to come up with an appropriate motivation if they want their players to actually see this through. Perhaps an important love interest or NPC is lured off by the purple mist, or a lost MacGuffin can only be found in the depths of the place? The adventure seemed light on monetary treasure for the level of characters that would be exploring it. On the other hand, it's loaded with magical treasure (although pretty much all of the magical treasure is in the hands of the serpent people and will be used against the players!) I actually went back and added up the monetary treasure to confirm my suspicions - it seemed to be about 80,000gp (a group of 7-10th level guys probably needs 300k-400k in loot to level up). If you're not playing AD&D (with magic item XP) you might need to add gems and jewelry. Normally I would take a moment and discuss how the enterprising DM can add some horror elements to the adventure and give it a horror twist. Between the copious serpent people mummies, the massive god of the serpent folk slumbering beneath the city, the numerous death traps, and the atmosphere, achieving some horror won't be a problem. I don't necessarily see myself running this in Gothic Greyhawk because of future plans (though you never know - this is worth trying to work in). However, the players in the kid's game are already lost in the desert as we explore B4 The Lost City - if they survive long enough, this could be a good follow up to B4. On the other hand, this might be a bit too intense for young folk! I liked it a lot, and would give it 3.5 out of 5 stars on the Beedometer. Despite some modest flaws, it has a really great atmosphere. Unless they really bring something to the table and provide excellent ideas, plot hooks in modules just get in my way. I can see where they would help newbie DM's, but after doing this for almost 30 years, it's just not needed. Love Serpent Men! I agree James - I'd want more design time put towards really evocative locations over plot hooks; let me worry about how to get the story going. I hope The Nameless City is a hit, I'd like to see more products like it. Munchkins of the Old School - Revealed! Mythic Monday: The Priest Fight!